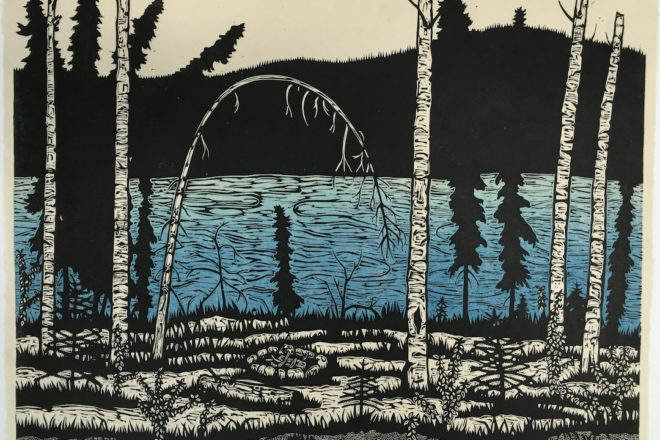 If you’ve paid attention to upcoming events at the Peninsula School of Art (PenArt), you may have noticed a common theme: printmaking. The first exhibit of 2019 is Midwest Made: Contemporary Print Invitational, and the first fundraiser of the year is Winter Print. The investment was in new printmaking equipment. On Thursdays from November to April, 5:30-8:30 pm, PenArt opens its studios to artists of all levels who would like to work independently on life drawing, painting, ceramics, metals or printmaking. In the printmaking studio, there’s an etching press for monotype, collagraph and relief, as well as an exposure unit for screen printing. No instruction is provided, but a staff member is available to answer questions regarding the proper handling of the equipment and materials. The artists who met that criteria are Brian Borchardt, April Katz, Melissa Wagner-Lawler, Jeffrey Morin, Yoonmi Nam, Gail Panske, Miguel Rivera, [Printmaking Lecturer] Andy Rubin and Josh Winkler. Along with being printmakers, these artists are all based in the Midwest, and many are in a teaching position at a university or college.